United Nations climate talks end today in South Africa and the United States and China are playing chicken on who will take the lead in stewarding the environment well while also driving economic development. 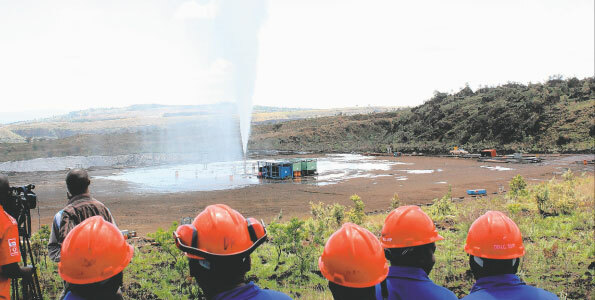 Quietly, Kenya has signed major deals just this year that will see the opening of at least three plants that will grow Kenya’s geothermal capacity to 514 megawatts (MW) by 2014. By 2030, Kenya aims for geothermal energy to make up 5000 MW of the total 15,000 MW of power the country will produce to meet growing demand – an estimated $16 billion investment. Imagine that, an African country driving the uptake of clean and renewable energy. Experts estimate that Kenya has the potential to generate 7,000 MW to 10,000 MW. The country began developing geothermal in the 1980s and currently produces about 209 MW. In 2008, the country set its geothermal power goal in the Vision 2030 strategic plan. Since that time Kenya has aggressively grown geothermal with the 36 MW expansion of the 48 MW Olkaria III, the construction of the 280 MW Olkaria IV, and the drilling of the 1,600 MW Menengai field. Contrary to what the Wall Street Journal reported on December 6, Kenya is not the only African country developing geothermal energy. Kenya lies within the East African Rift System that runs 6,500km from Tunisia to Mozambique. In a recent conversation with Dr. Meseret Zemedkun of the United Nations Environment Program (UNEP), she explained that some countries in the East African region are looking to complement their current hydropower capacity, while others like Eritrea and Djibouti are looking for primary renewable energy sources. Ethiopia has drilled a pilot 7 MW plant. Eritrea is conducting detailed exploration. Djibouti is drilling wells, and Uganda and Rwanda are conducting semi-detailed and detailed exploration. According to Dr. Zemedkun, “[African] countries are very keen to develop their resources.” She cited the high availability rate of geothermal compared to hydropower – 90-95 percent versus 50-55 percent. Changes in weather impact the availability of hydropower whereas geothermal energy is not impacted by changes in weather. Furthermore, enhanced technology is reducing the unit price of geothermal energy, increasing its accessibility to African countries. Dr. Zemedkun is currently driving the African Rift Geothermal Project, an initiative that brings together several African countries in working to build their geothermal capacity. It also helps reduce the risks of exploration through exploration studies, site selection, and surface exploration. UNEP partners with the World Bank in this work, leveraging its risk mitigation fund to further the exploration of geothermal energy. I am excited about the work Kenya is doing to develop its geothermal energy capacity. Its leadership has also kickstarted the exploration of geothermal energy in other countries along the East African Rift System. Hopefully, the US and China will figure out a way to do their part and contribute to the preservation of this earth while meeting the economic needs of their citizens.